That’s right we focus on removal of stains, odours, and insects that cause damage like fleas, moths and carpet beetles. Many carpet cleaners just clean carpets and miss out the really important things that are unsightly, cause damage or produce unpleasant odours in the home. We are specifically trained to deal with hundreds of stains, have a 101 spotters to choose from and will use our know how to to deal as best as possible with your unsightly carpet or upholstery stains. Whether that’s red wine, tea, coffee or anything with a deep colour. Just recently we have been trained & licensed to treat & eradicate fleas, moths and beetles using professional solutions you cannot buy over the counter. This is a very effectove procedure and normally one visit will kill of any unwanted insects. Very useful if you have had pets and are selling or vacating a rented property, its a sure way of leaving the property in tip top condition with nothing to worry about. We have also tried & tested the best odour solutions and currently use what we think is outstanding, Craftex Kill Odour……..it doesnt jsut mask the smell it has a snaitizer to kill of the germs that produce the odour and coupled with apleasnt smell is absolute winner in eradicating unpleasant odours. Give us a phone and we will talk through your problem and come up with a solution that is just right for you………..That’s our service…….a complete tailored service for you , not a one size fits all ! 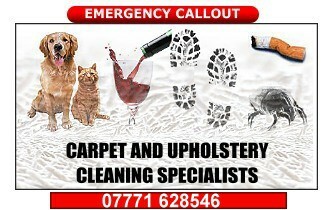 Not all carpet cleaners are created equal……….we like to think we go above & beyond all the rest…..